As I stand at the edge of Kinabalu National Park waiting for cars to pass, I can hear the callings of the exotic birds in the dense forest to my side. There’s a calmness that sets in with the mist that starts to cover the road. A group of men repairing a house not far from me stare in amazement as I stick out my thumb. They talk to each other in Malay while looking in my direction. I imagine the types of things they are saying about me, but from the neutral tone of their voices I cant decipher if they are positive or negative. They continue to look on with curiosity long after their conversation about me ends. As quickly as the mist rolled in, it disappears and the coolness of the morning is lost as the sun peaks through the clouds. Cars start to pass more frequently, and while nearly everyone is waving as they pass, no one stops yet. I hold a sign for Sandakan, but soon opt to drop the sign and just use my thumb. That seemed to work well as a silver 4×4 Isuzu pulls over. It’s a young couple, and they are headed to Ranau; not so far, but I opt to take the lift anyways. 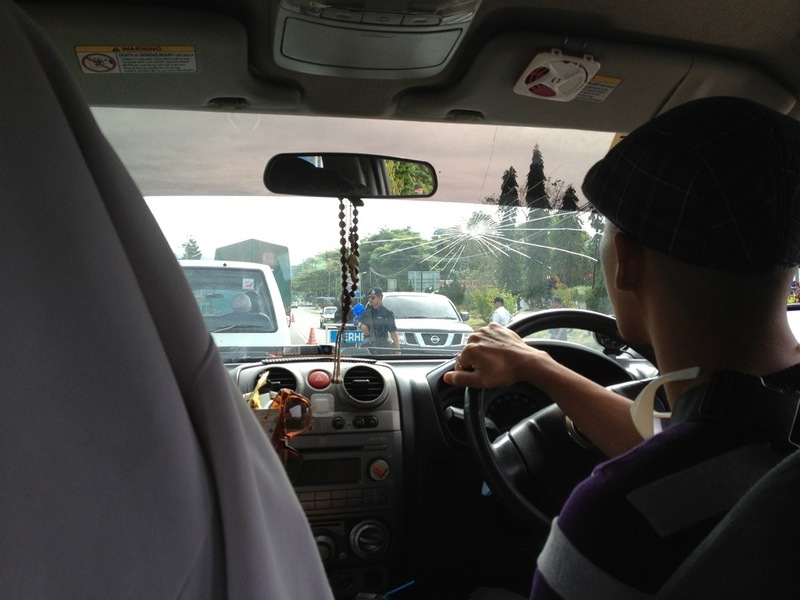 Ming, the driver and his wife Awu were driving home from Kota Kinabalu. Ming runs a sheesha cafe at a beach outside of KK until late at night and then drives back with his wife early in the morning. We talked the whole way to Ranau, and as usual in Malaysia, they offered to drop me off at the bus station there. While nearly everyone understands the concept of hitchhiking, and knows what you want when you’re standing on the side of the road, they still don’t grasp the concept that you plan the hitchhike the entire way to your destination. So again, as usual I say that it’s ok to leave me at the side of the road. Ming asks if I would like to join them for a tea before I continue and since it’s still early I say yes since I was quite enjoying our conversation. Ming also tells me that the cafe we’re at makes a great ‘Bak So’ soup. I had no idea what it was, so I decided to give it a try. Ming explained that it was a meal originally from Indonesian Borneo but with immigration came the soup as well. It was quite delicious with noodles, chicken breast, balls of meat and boiled egg inside. Ming refused to let me pay, even though I insisted. I’ve found this also to be a pattern in Malaysia. While sitting at the table, Ming called his cousin who lives in Sandakan to check about the road blocks along the way because of the situation with Filipino rebels that was going on at the moment. I had no idea what they were talking about, but after he hung up he told me that he had good news. Ming and Awu were going to visit his family in Sandakan, which was just past my destination of Sepilok. I can’t be sure, but it just seemed like too good of a coincidence that they happen to be going an extra 220km (they had only taken me 20km so far). Maybe they were concerned with my safety. Or perhaps taking me was just an excuse to visit family, but in any case I lucked out. 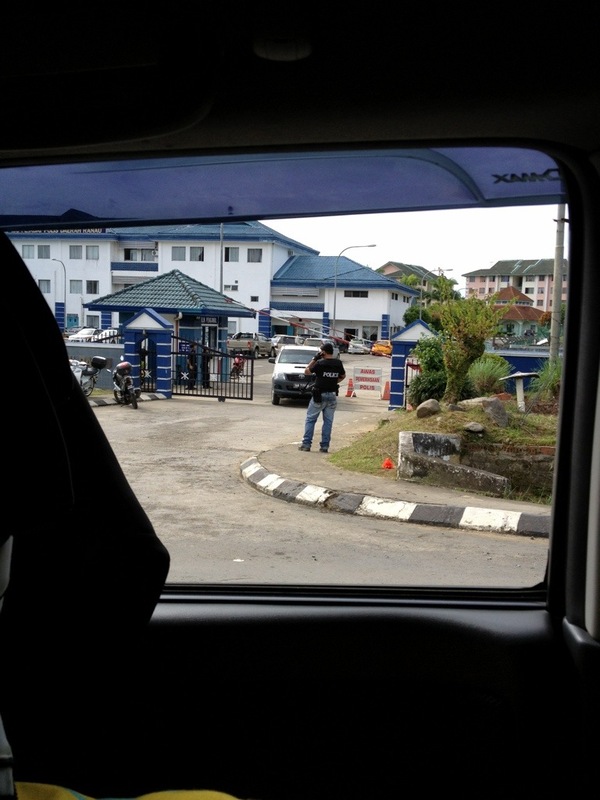 Just outside of Ranau there was a large police presence with a checkpoint. With the killings that had recently happened, the police were taking no chances. As we continued our drive, the cool mountain air and twisting roads thru the rainforest gave way to the humid air of the lowlands. 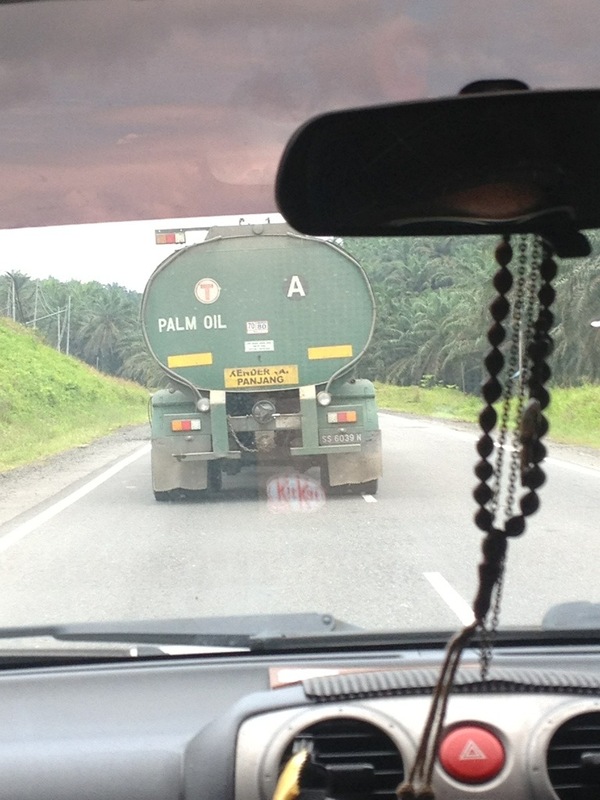 We were no longer passing forests, as the scenery suddenly changed to palm oil plantations. To read a little bit about the deforestation of Borneo on Wikipedia, click here. Malaysia exports half the palm oil for the entire world, and for the next 180km we would drive through the largest single plantation in the world. Along the way we talked about many things, but the most interesting conversation revolved around Islam. Both Ming and his wife were Muslim, just as over 60% of the population is. While I knew some of the basics of the religion, they really went into some of the details. They helped me answer a question I had been wondering about since I saw little girls wearing hijabs. Although the Quran says to start wearing one at the age of puberty, and certainly a 3 year old girl isn’t going through puberty, I saw this over and over. I had the impression that this was perhaps taking the religion too strictly, but they explained that it’s easier for a small girl to get used to it then a hormonal teenager. While this makes sense to me, I still haven’t made up my mind on the issue. We also talked about prayer, and while I knew Muslims pray 5 times a day, I didn’t know what those times were other then before sunrise and after sunset. I also didn’t realize that the amount of prayer differs from the morning to the night. For clarification, 2 prayers before sunrise, 4 prayers at noon, 4 prayers in the afternoon, 3 prayers just after sunset, and 4 prayers around nightfall. While I would have loved to talk with them more, soon the turnoff for Sepilok and the Orangutan sanctuary came and it was time to say our goodbyes. They wished me luck on my trip, and I thanked them heavily for the ride and soup before we parted ways. 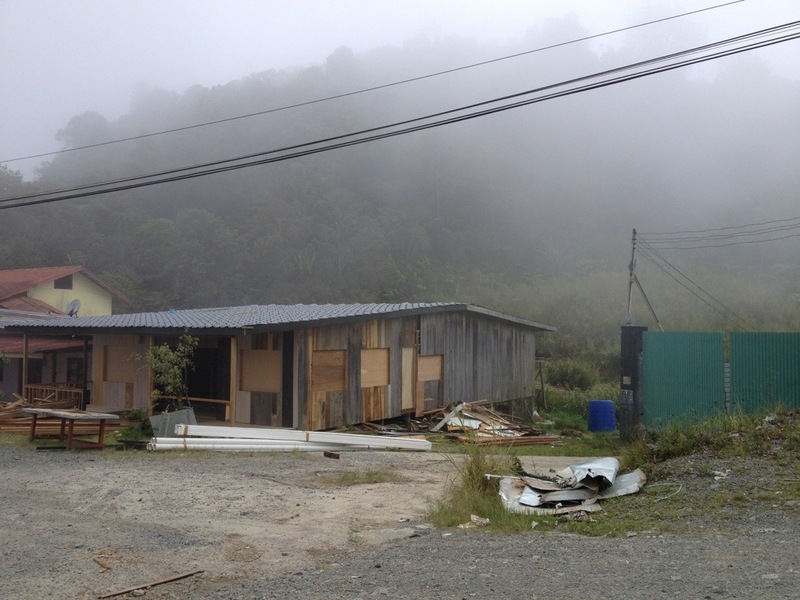 « The costs of climbing Mount Kinabalu in one day. Nice story! We hitch-hiked in Malaysia during our Southeast-Asian trip four years ago and it was more or less how you described it, lots of curious looks, people waving and offering to take us to a bus or train station. And of course, people going out of their way to help us, too. Lovely people and a beautiful country! I’d be curious to know if you’ve hitchhiked in other countries in Asia. I attempted it once in Laos and gave up when the sunset. It was cheaper to take an overnight bus then to stay in a hotel and continue hitchhiking in the morning. Most people who stopped were minibus/taxis and obviously wanted money. Plus there isn’t much of a language barrier here in Malaysia. We did hitch-hike in Laos and in fact we had a really great experience there and no problems getting around. We found Lao people super friendly! The only country in Southeast Asia where we didn’t manage to hitch-hike was Vietnam as people there weren’t that keen on hitch-hikers or Westerners in general. 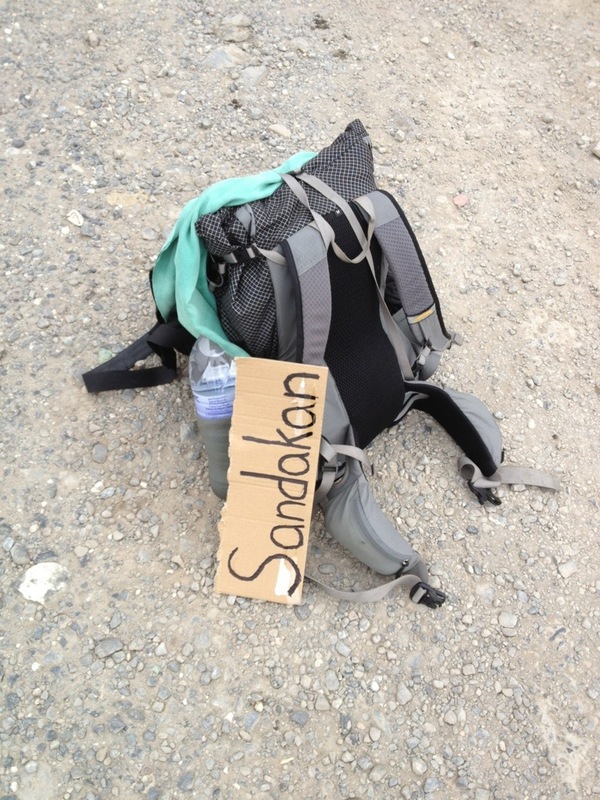 Oh, I found Laotian people extremely friendly too…just maybe that most didn’t understand what hitchhiking was. The people who stopped always asked for money. Like I said they were mini buses and stuff. After that one experience I was in Thailand and didn’t have the opportunity to try it again. And I could have guessed that about Vietnam. Very interesting country, but not the most friendly in touristy areas.